The hand-gilded print on plaster Buddha Shakyamuni, Gyantse Kumbum (ca. 1420), in a handmade hardwood frame. 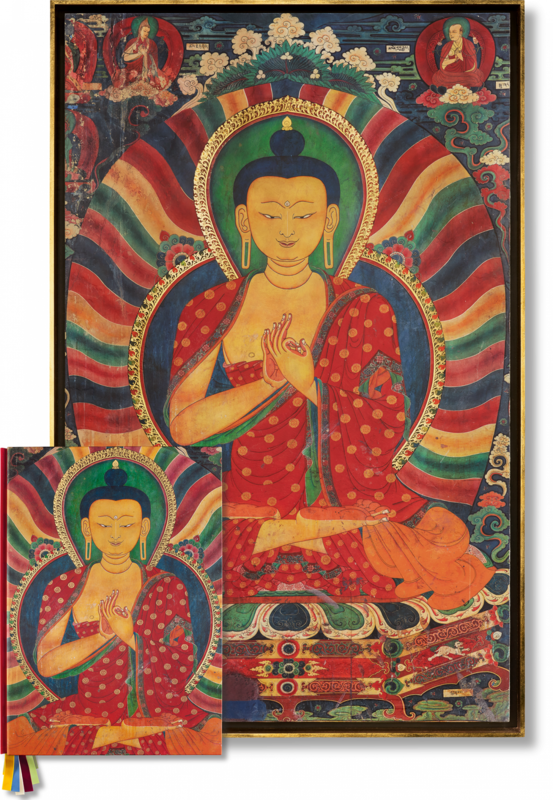 The piece depicts Shakyamuni with a golden complexion, surrounded in a rainbow aura as he displaying the teaching gesture. The long ear lobes indicate that before enlightenment, the Buddha was Prince Siddhartha and wore heavy gold earrings—thus stretching his ear lobes. They also remind us of his great renunciation, where he left his wife, child, and all the treasures of his palace, before setting out on the path—involving years of austerities and meditation—that led to his enlightenment. The SUMO. 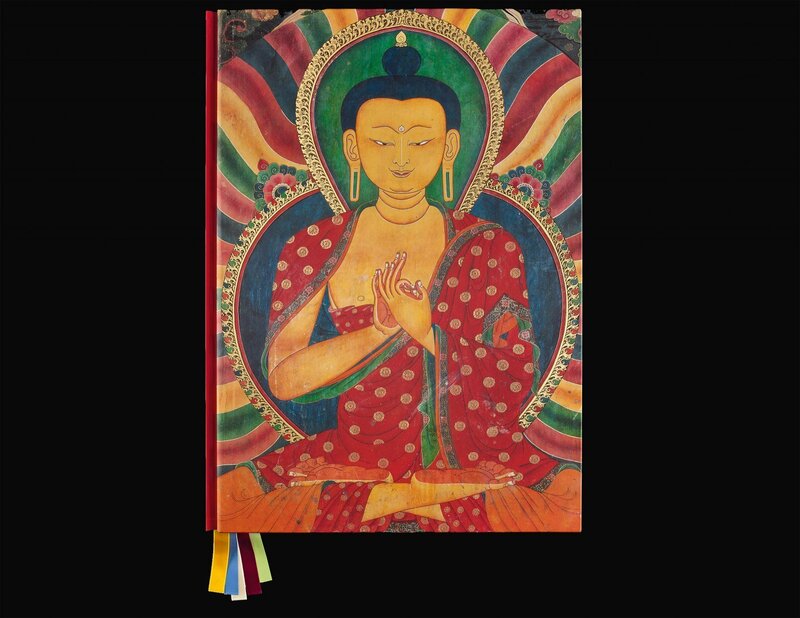 Its cover depicts Buddha Shakyamuni in a masterpiece from the Gyantse Kumbum painted by Konchok Zangpo in the early 15th century. 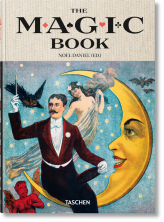 The scholarly companion book. 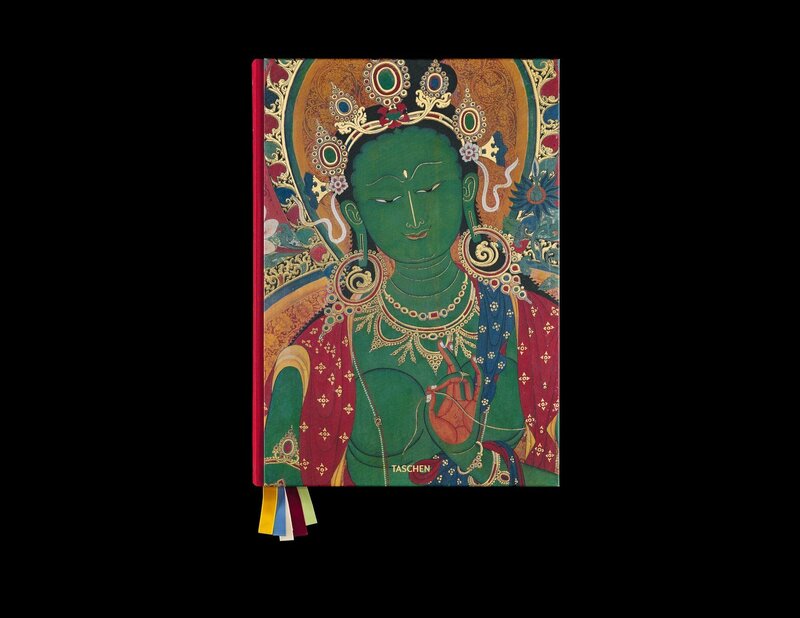 Its cover depicts the Green Tara of the Sandalwood Forest, a masterpiece from the Gyantse Kumbum painted by Gewa from Dechen in the early 15th century. 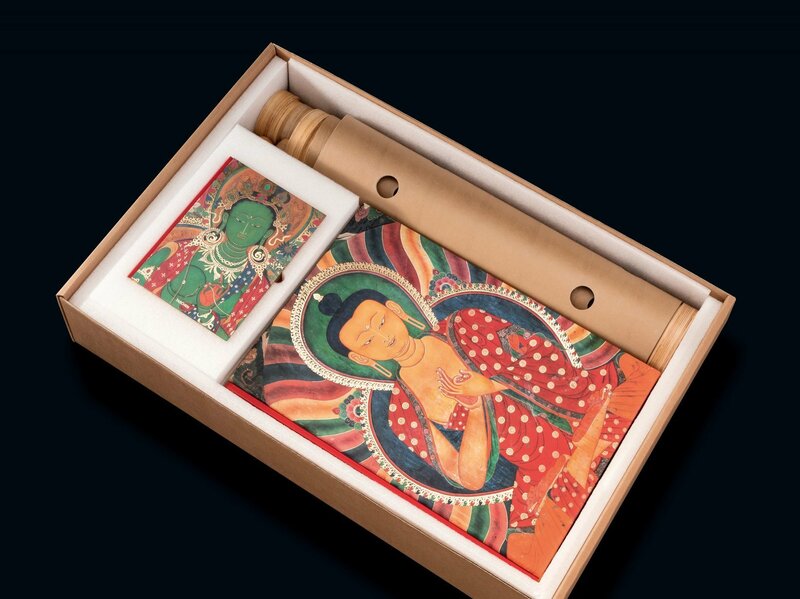 Murals of Tibet features five bookmarks which have been carefully selected to match the colors of the Buddhas of the Five Families—a central concept of Tibetan Mahayana Buddhism. SUMO, scholarly companion book, and the modular Shigeru Ban bookstand as arranged in packaging. 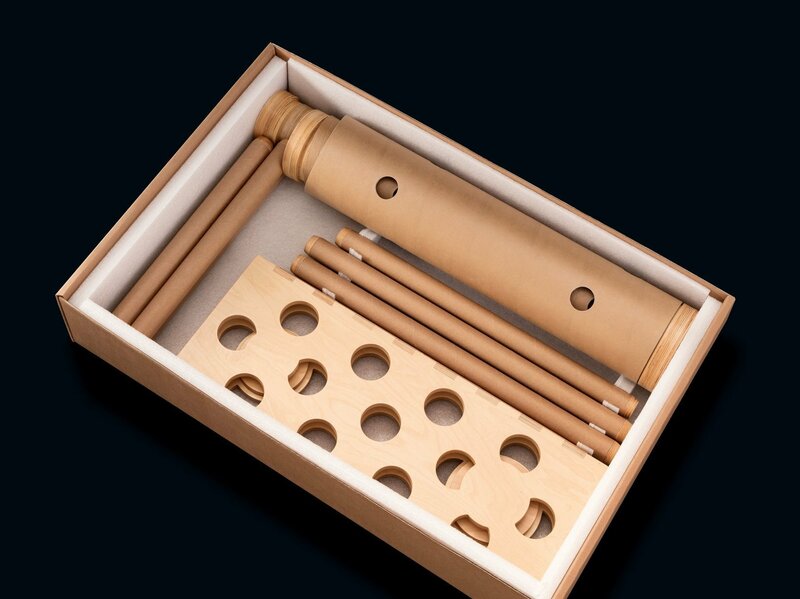 The modular Shigeru Ban bookstand, as packaged once SUMO and scholarly companion book are removed. The hand-gilded print on plaster Buddha Shakyamuni, Gyantse Kumbum (ca. 1420), in a handmade hardwood frame. 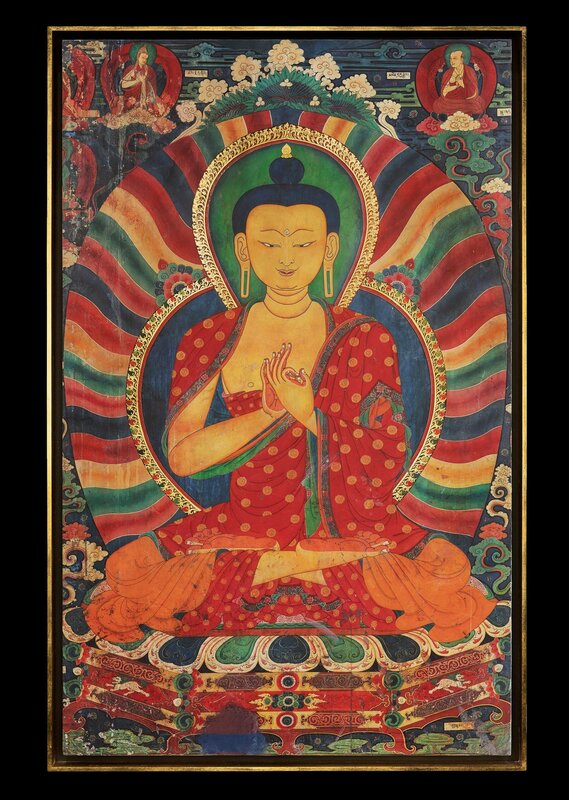 The piece depicts Shakyamuni with a golden complexion, surrounded in a rainbow aura as he displaying the teaching gesture. The long ear lobes indicate that before enlightenment, the Buddha was Prince Siddhartha and wore heavy gold earrings—thus stretching his ear lobes. They also remind us of his great renunciation, where he left his wife, child, and all the treasures of his palace, before setting out on the path—involving years of austerities and meditation—that led to his enlightenment. 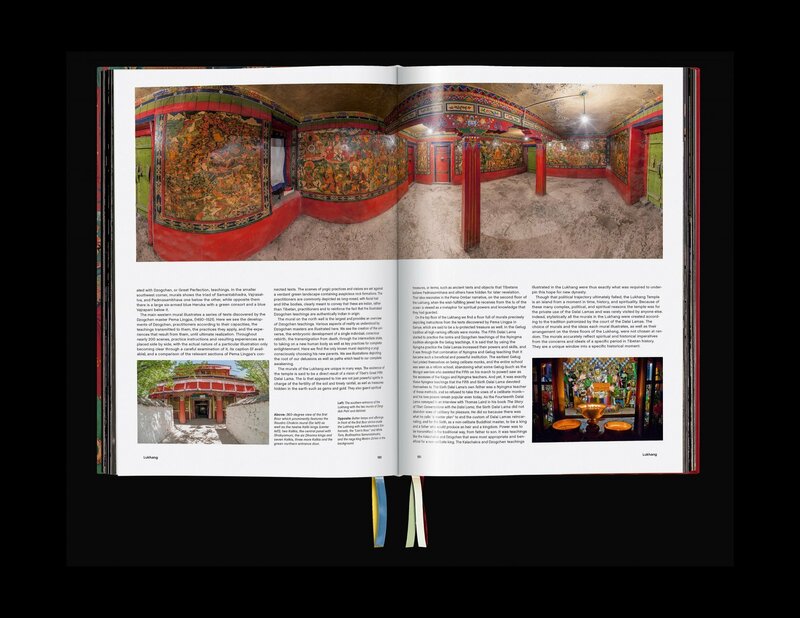 This SUMO-sized publication presents the most precious surviving murals of Tibetan Buddhist culture. For the first time, these astonishing and intricate masterpieces can be appreciated in blazing color and life-size resolution. 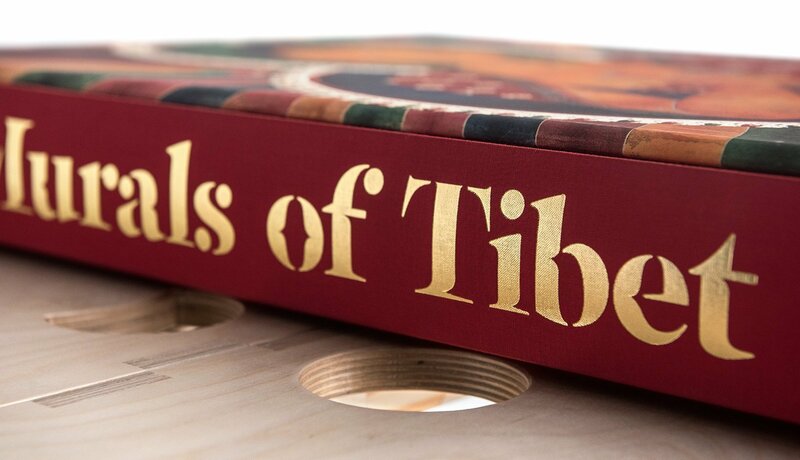 Signed by his Holiness the 14th Dalai Lama, the book is a revelation for scholars, aficionados of Tibet as well as for practitioners of Buddhism, yoga, meditation, and mindfulness. 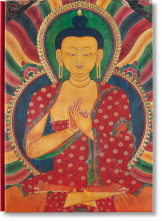 This Art Edition comes with a large-scale reproduction of a mural depicting Buddha Shakyamuni, limited to just 40 copies. Printed on plaster and hand-gilded with 23.75-karat gold, this piece evokes all the overpowering radiance of its centuries-old original. The result is a work of breathtaking beauty and a truly immersive experience of the World Heritage landmarks preserved in our SUMO. Art Edition (No. 1–40), with a hand-gilded print on plaster Buddha Shakyamuni, Gyantse Kumbum (ca. 1420), in a handmade hardwood frame with 23.75-karat gold. 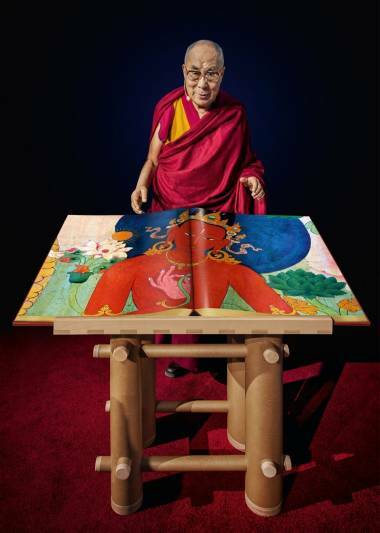 This artwork comes with the limited-edition SUMO, signed by His Holiness the 14th Dalai Lama, and the Shigeru Ban bookstand. Hidden amidst soaring snowy mountains, deep valleys, and desolate deserts are some of the greatest treasures of Buddhist culture and Tibetan heritage. 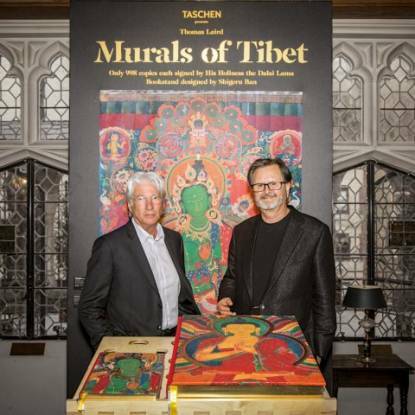 For more than a decade, photographer Thomas Laird traveled the length, breadth, and far-flung corners of Tibet’s plateau to capture the land’s spectacular Buddhist murals in all their sublime vastness, intricacy, and their spiritual, emotional, and psychological enrichment. Deploying new multi-image digital photography, Laird compiled the world’s first archive of these artworks, some walls as wide as 10 meters, in life-size resolution. 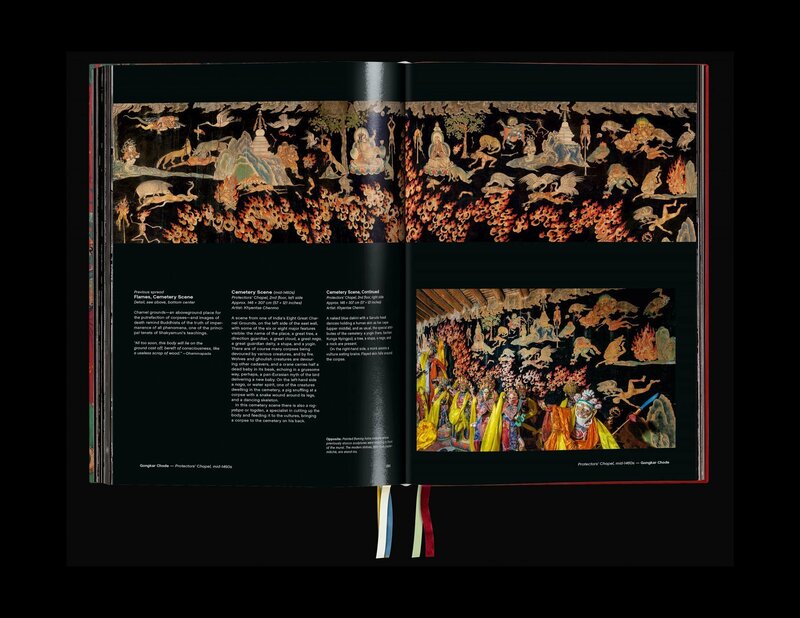 This breathtaking publication assembles Laird’s portfolio in extra-large format with six fold-outs, printed in five colors including gold. 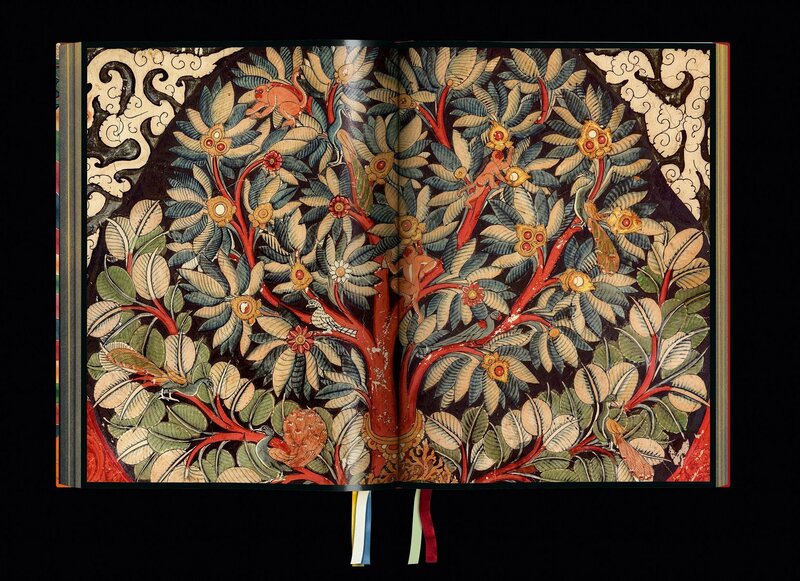 Featuring both complete murals and copious details, it immerses readers into these precious, extraordinary masterpieces. 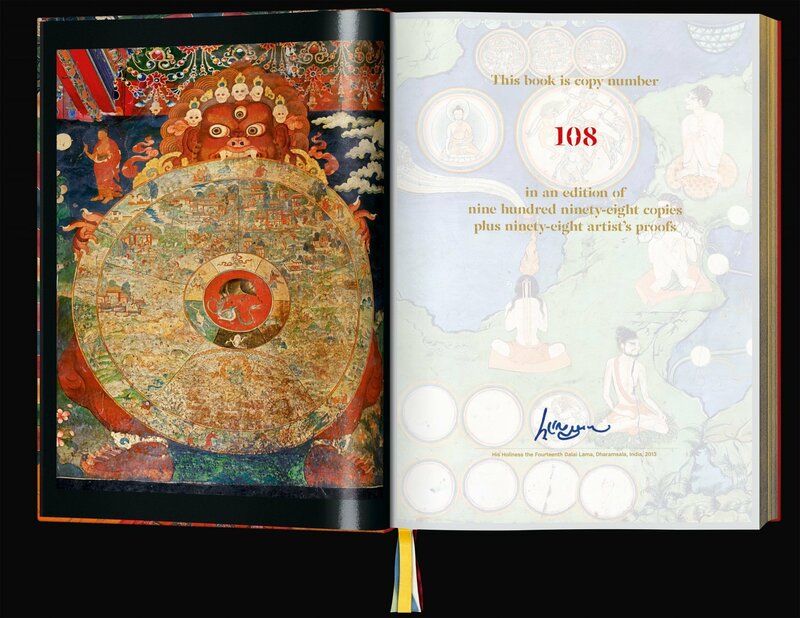 In recognition of this World Heritage landmark and preservation of Tibetan culture, His Holiness the 14th Dalai Lama has signed all copies of this Collector’s Edition. 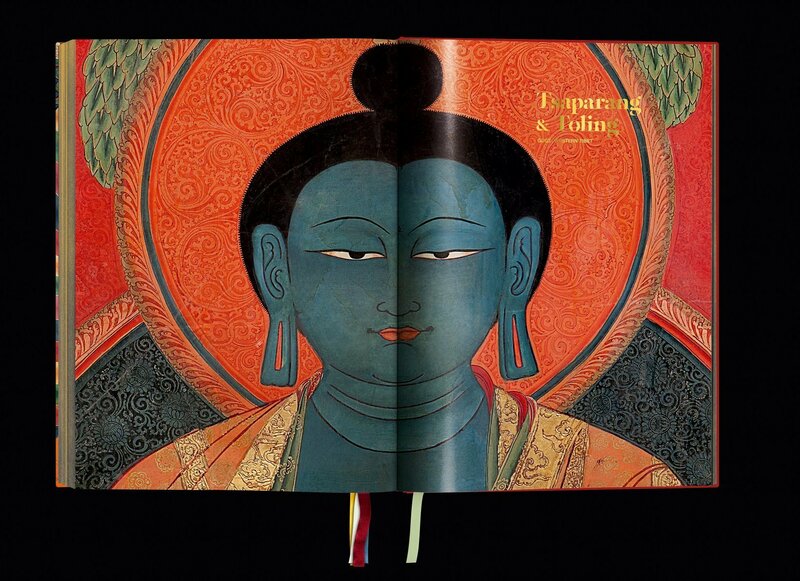 In the 528-page scholarly companion, Buddhist writer and academic Robert Thurman takes us through this transcendent journey with detailed text on the murals' spiritual significance while captions from experts Heather Stoddard and Jakob Winkler shed light on the storylines and artistic context of each image. 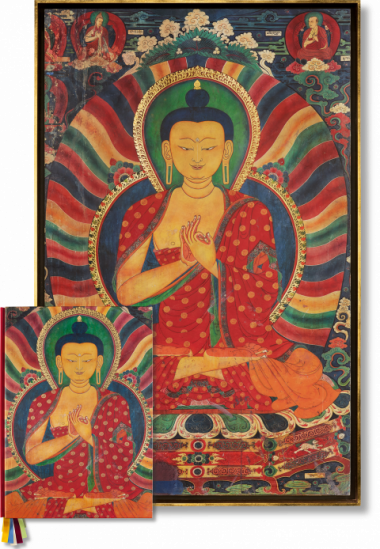 The Art Edition comes with a handmade, large-scale reproduction of a mural depicting Buddha Shakyamuni, a masterpiece from the Gyantse Kumbum painted by Konchok Zangpo in the early 15th century. Limited to just 40 editions, this piece evokes all the overpowering radiance of its centuries-old original. It is crafted on plaster using the finest over-size printers and presented in a handmade hardwood frame with 24-karat gold. The result is an immersive meditation piece and a unique experience of the monuments preserved in our SUMO. As his Holiness the Dalai Lama has himself explained, these murals are not just objects of beauty, but serve as points of reference and guidance for practitioners of Buddhism, yoga, and meditation, as well as for anyone seeking to incorporate mindfulness into their daily life. 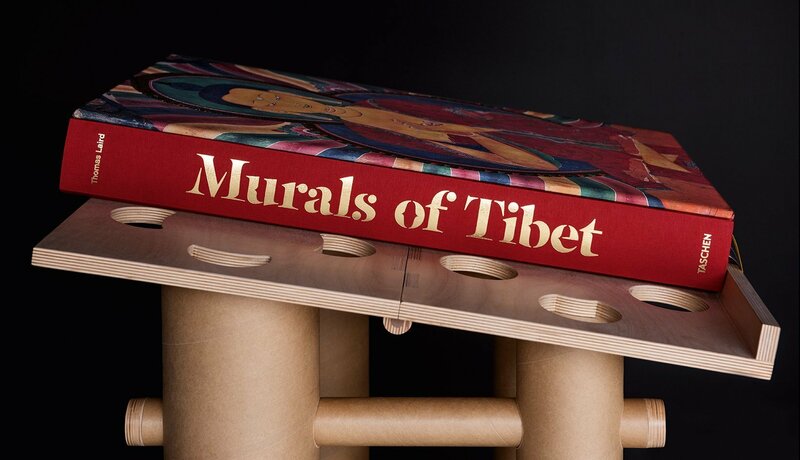 Binding contemporary photographic technology with ancient traditions, this book and artwork are a major milestone in the appreciation of Buddhism, a precious monument to Tibetan culture, and a vital source for the contemplative arts and sciences. SUMO-sized Art Edition (No. 1–40), with the hand-gilded print on plaster Buddha Shakyamuni, Gyantse Kumbum (ca. 1420), in a handmade hardwood frame. This artwork comes with the limited-edition SUMO, signed by His Holiness the 14th Dalai Lama, and the Shigeru Ban bookstand. Also available as a second Art Edition (No. 41–80) with an alternative artwork, and as a Collector’s Edition (No. 81–998). 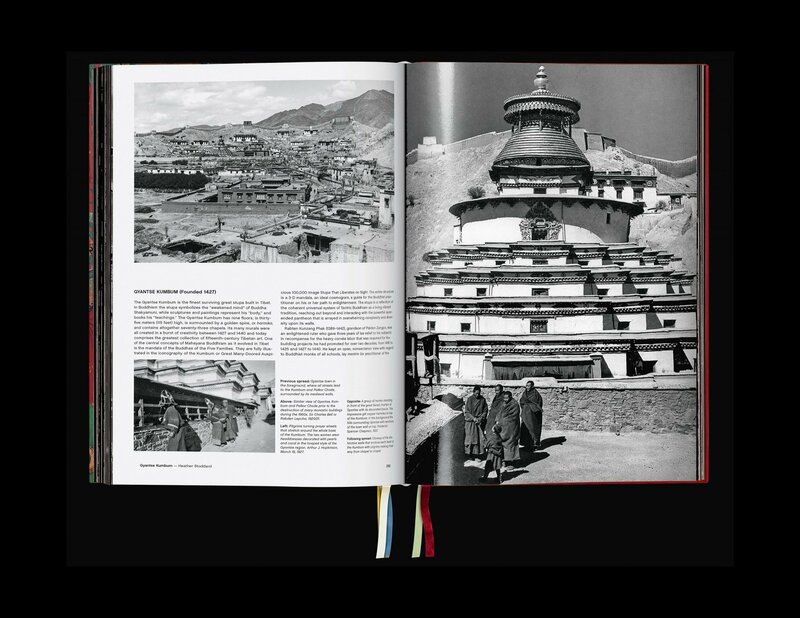 American photographer and writer Thomas C. Laird has explored the art, culture, and history of the Himalayas since 1972. Based in Nepal for three decades, his reporting and photography have been published globally by TIME, Geo, Newsweek, Le Figaro, National Geographic, and many others. His nonfiction books include a history of Tibet written with the Dalai Lama, translated into 14 languages. 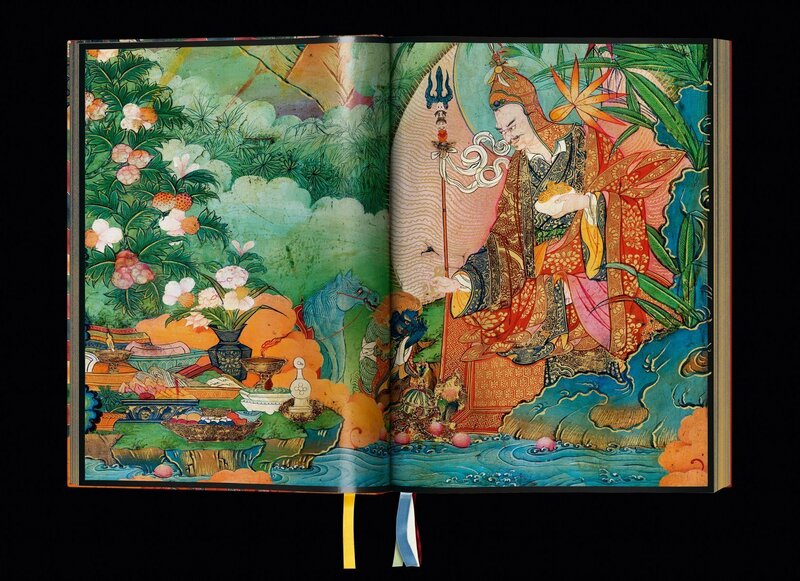 From 2008, he has created the world’s first life-size images of enormous Tibetan wall murals. Fine art prints of these works have been the focus of several exhibitions and are held in both public and private collections. Robert A. F. Thurman is an American writer and scholar of Tibetan Buddhism who holds a PhD from Harvard University. He is the Jey Tsongkhapa Professor of Indo-Tibetan Buddhist Studies at Columbia University, holding the first endowed chair in this field of study in the United States. Co-founder and president of Tibet House US, Thurman was ordained as a monk in 1965 by the 14th Dalai Lama, with whom he is close friends. He was once designated by TIME magazine as one of the most influential people, and remains a strong advocate for Tibet. Heather Stoddard is a semi-retired professor of Tibetan literature, history and language at INALCO in Paris. Born in England, she studied Chinese and Tibetan at SOAS and the Sorbonne, becoming one of the first scholars to study modern Tibetan intellectuals. She has authored several essays and books on the history of Tibet, including The Beggar from Amdo, the definitive biography of monk and polymath Gendun Chophel, and Tibet from Buddhism to Communism. She writes extensively on Tibetan literature and art and has traveled annually to the Tibetan plateau for over three decades. She lives today in Oxford, UK. Jakob Winkler is a scholar, translator, editor, and teacher in the field of Tibetology and Buddhism. 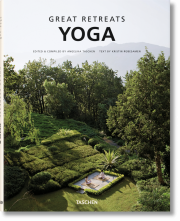 He has studied and practiced Buddhism since the mid-1980s under various masters. Winkler’s main teacher is the Dzogchen master Chogyal Namkhai Norbu, from whom he received authorization to teach dharma in 2002 as a Santi Maha Sangha instructor. He is one of the few Western experts of Dzogchen and has contributed fundamental research to the understanding of Lhasa’s Lukhang temple, being the first Western scholar to identify Pema Lingpa’s treasure texts as the source for its murals. Shigeru Ban (born in 1957) attended the Tokyo University of the Arts, SCI-Arc in California, and the Cooper Union School of Architecture in New York. A member of the Voluntary Architects Network and winner of the Pritzker Prize in 2014, Ban’s innovative use of recycled materials has supported humanitarian efforts around the world. He is based in his native Tokyo and Paris. 2. Why was a donation made to the Mind & Life Institute? His Holiness, as a monk, does not own anything except for a few personal items, so he asked TASCHEN to support the Mind & Life Institute. His choice, his action, speaks loudly. Mind & Life’s mission is to “integrate science and contemplative practices and wisdom traditions to reduce suffering and promote flourishing.” The foundation funds research that examines how the brain, health, and human behavior are transformed by meditation. Some research shows that the brains of adept practitioners respond differently to stimuli in measureable ways. They appear to react in a calmer way than those of us who have not had such intense training. Perhaps there are strategies we can incorporate into our daily lives that will allow us to respond to the challenges of life with less anger, more resilience, and more compassion. For the Dalai Lama, this path is important for humanity, our survival, and the future of our planet. our actions? Or will we consciously choose our words and deeds so we can set out on a wiser path? May these timeless masterpieces continue to serve such ideals far into the future. 3. How did the stand come about and what is its significance? 4. What are the assembly instructions for the bookstand designed by Shigeru Ban? Please consult the illustrated assembly instructions that come with the table. According to the artist’s instructions, the legs should be assembled from back to front, working from widest (back right) to smallest (front left). The stabilizer bars can be inserted from either side; be sure, however, to always start from the top. As the last step, unfold the wooden platform and position it on the base. Before placing the book flat onto the platform, check for stability. 5. What are the care and cleaning instructions? 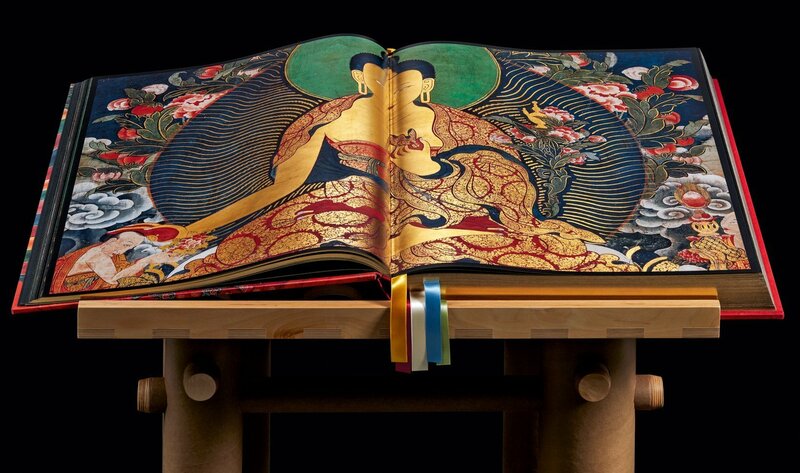 The book contains 6 fold-out pages. To avoid damaging these, always fold each one back in carefully before turning to the next page. Please also keep in mind that the book is sensitive to UV light. If you consistently leave it open to the same pages, the colors may eventually fade slightly. It is advisable to wear the supplied gloves when leafing through the book or handling the table. 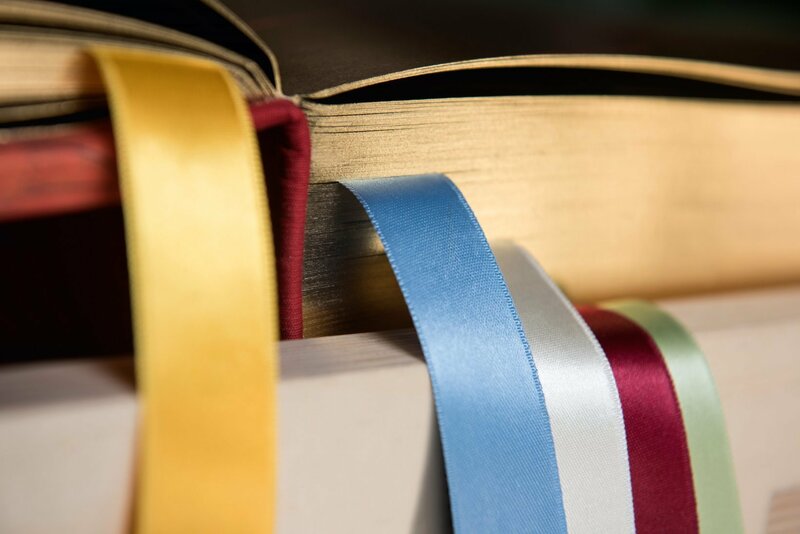 Fabric elements and the cloth of the book are vulnerable to damage and stains, so please treat them with care. The elements of the table, including the paper tubes and wooden platform, are delicate and should be cleaned only with a simple dry rag. The stand is made to support the book only. 6. 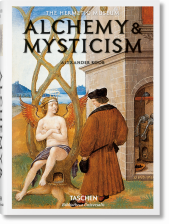 What is the function of the scholarly companion book? Gathering together only the murals, the SUMO offers an immersive experience by letting these transcendent works of art speak for themselves. Meanwhile, the scholarly companion book acts as a visual index for the SUMO. 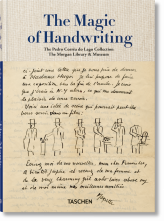 Its general layout retraces that of the main volume, providing full captions and further context to enlighten readers as to what these works represent. 7. 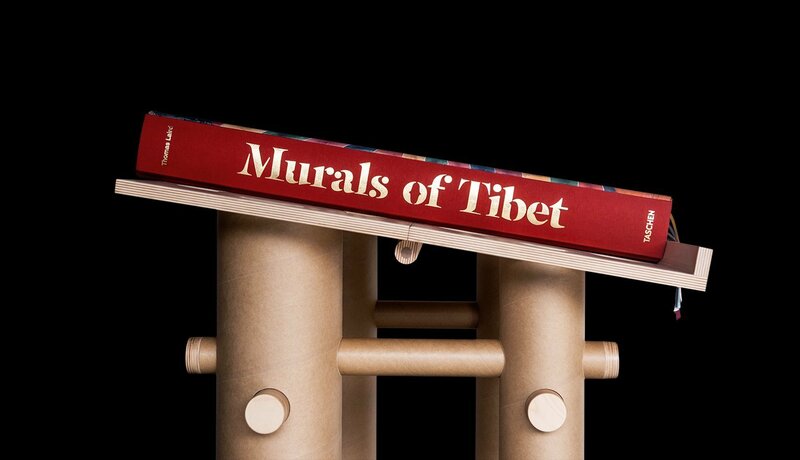 How is Murals of Tibet organized? 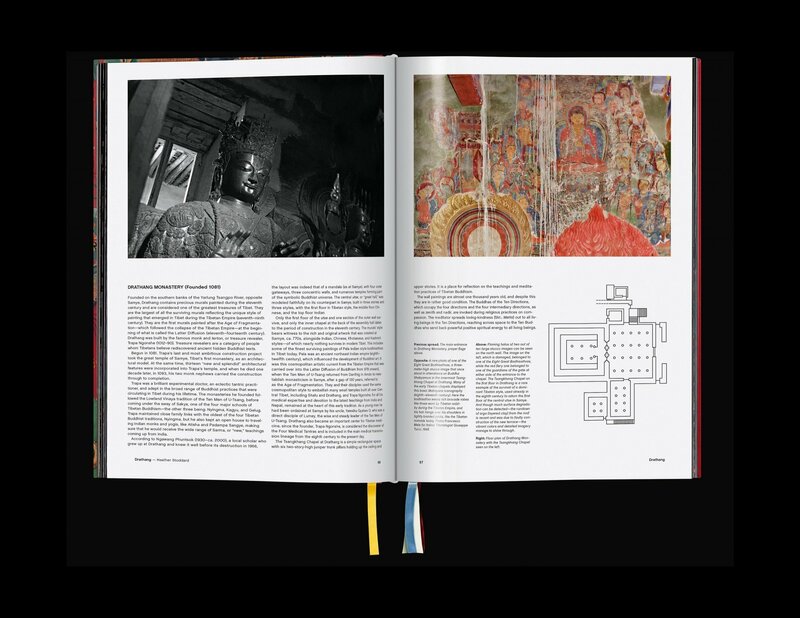 This book presents the oldest surviving large-format murals in Tibet, taking you on a geographic journey starting at Drathang and continuing through the major monastic sites of Central and Western Tibet (past the holy mountain Mount Kailash), where important murals have survived. It has thus been arranged along a route that might have been followed by pilgrims. In order to further orient the reader, foundation dates for each documented temple or religious site are given, followed by the date of restoration (if applicable), and approximate date of a particular mural. 8. Which texts were contributed? While Thomas Laird contextualizes his journey in realizing this visual archive in a personal essay, Bob Thurman gives an insightful account of the spirituality of Tibetan Buddhism. 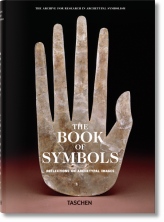 Heather Stoddard researched all the site descriptions and captions of the murals throughout the book with the assistance of Cameron Bailey, except for those of the Lukhang, which were researched by Jakob Winkler. 9. Which editorial conventions were applied? The authors of the texts in this volume each have their preferred system for transliterating and Romanizing Tibetan (and Sanskrit). In order to unify the text, however, we have opted to use a simplified phonetic spelling for Tibetan and the IAST system without diacritics for Sanskrit. This approach was taken for readability and coherence. Throughout the book, when describing place names, proper names, and religious or Buddhist terminology, the convention is that the names are in Sanskrit first, as all of these concepts first originated in India, followed by the Tibetan (in parentheses) on first mention, and then by any English equivalent. This convention is also followed in the Index, though Tibetan names are also indexed. 10. What are some of the artworks’ and sites’ particularities? 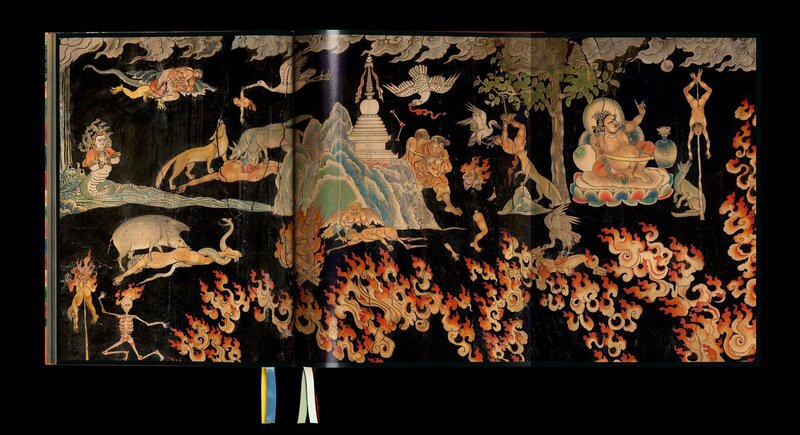 Tibetan mural art in situ is considered to be live spiritual instruction, and not purely a curiosity of art history. Older murals are thus periodically restored to ensure that the message within the composition continues to be visible to believers, though painters take care to restore only what was there in order to maintain whatever original instruction was intended. The upkeep of these cultural heritage sites, of unique importance for Tibetan Buddhist culture and art history, continues to be a challenge, despite the fact that numerous restoration projects have been mounted since the 1990s. Furthermore, murals in Tibet often cover entire halls, but they might also occupy only a small wall panel in a chapel. Some of the murals shown in this book are thus details from larger works, while in other cases they constitute an entire wall. In any case, we have given measurements for what is shown only. Dimensions in this volume are only given once per wall or mural, so that the reader gets a general sense of scale, but are omitted with subsequent details. In certain cases, due to local conditions, these numbers are approximations. 11. What makes these photographs such a groundbreaking achievement? Thomas Laird previously produced documentary-type images typical of the sort published up until recently to convey Tibetan art to the world. Starting in 2009, the technology of multi-image capture allowed for the creation of the first evenly lit lifesize images of the murals. 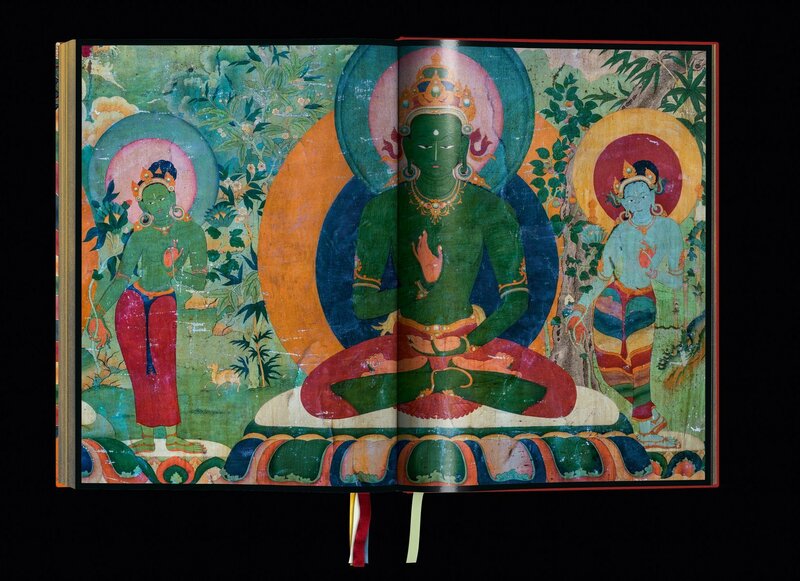 Such small spaces and the challenging conditions of Tibet made it impossible for predigital photographers to capture perfectly lit life-size images of such artworks. 12. Is there an abbreviated chapter overview? The inner chapel at the back of the assembly hall dates to the 11th century. The murals’ style bears witness to the rich and original artwork that was created at Samye, ca. 770s, alongside Indian, Chinese, Khotanese, and Kashmiri styles—of which nearly nothing survives in modern Tibet. 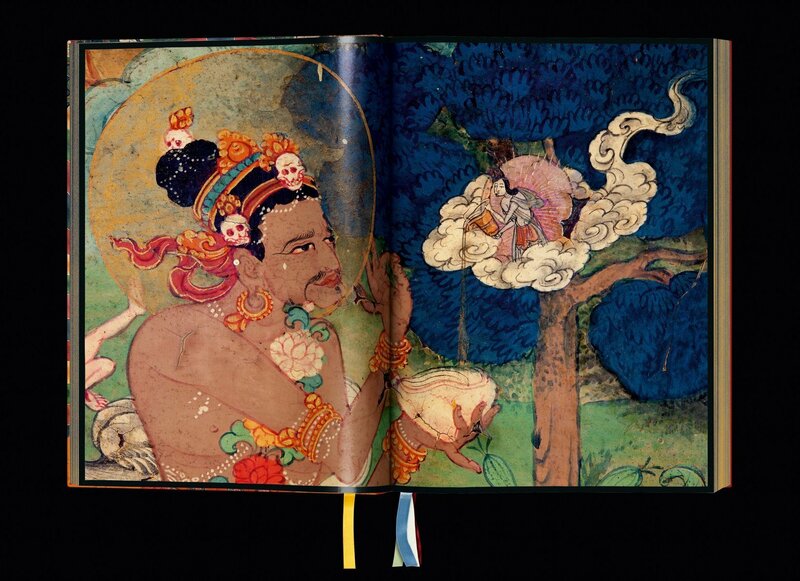 This includes some of the finest surviving paintings of Pala Indian style bodhisattvas in Tibet today. 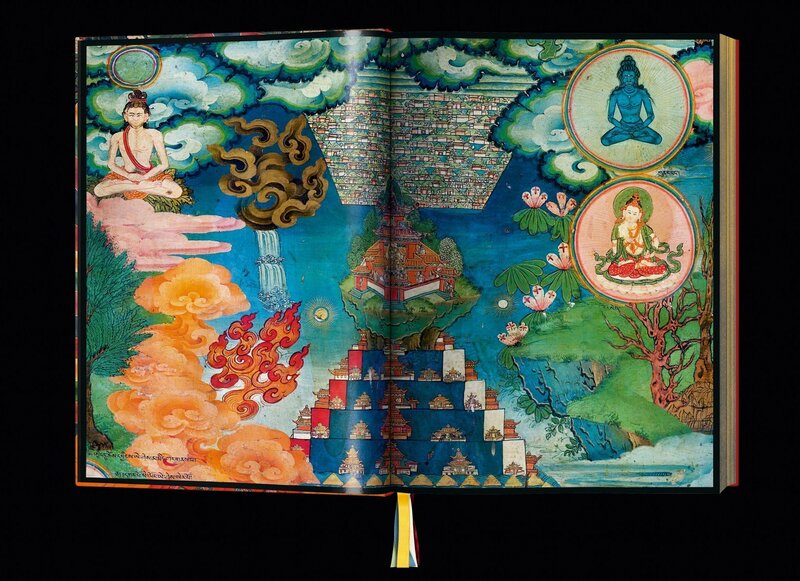 Pala was an ancient northeast Indian empire (8th–12th century), which influenced the development of Buddhist art. This site is a fine example of the flourishing period before the rise of the Gelug school. Today, some monks of Gongkar Chode maintain their centuries-old role among the caretakers of the Jokhang Temple in Lhasa. The surviving murals on the first and second floor of Gongkar’s assembly hall are outstanding examples of the Khyenri style, painted by one of Tibet’s greatest artists, Khyentse Chenmo, a close ally and contemporary of the monastery’s founder. Enshrines the holy Jowo statue of Lord Buddha, the first Buddha image brought to Tibet and one to which everyone must make a pilgrimage at least once in his or her lifetime. Clothed in swathes of golden-colored silk, it is hard for pilgrims to see anything but the face of the statue, but according to literary tradition, it is said to represent Siddhartha Gautama, as a young prince at the age of 12. The Shelrey Lhakhang features paintings from the 10th and 11th century, as well as 7th-century carved juniper doorframes. 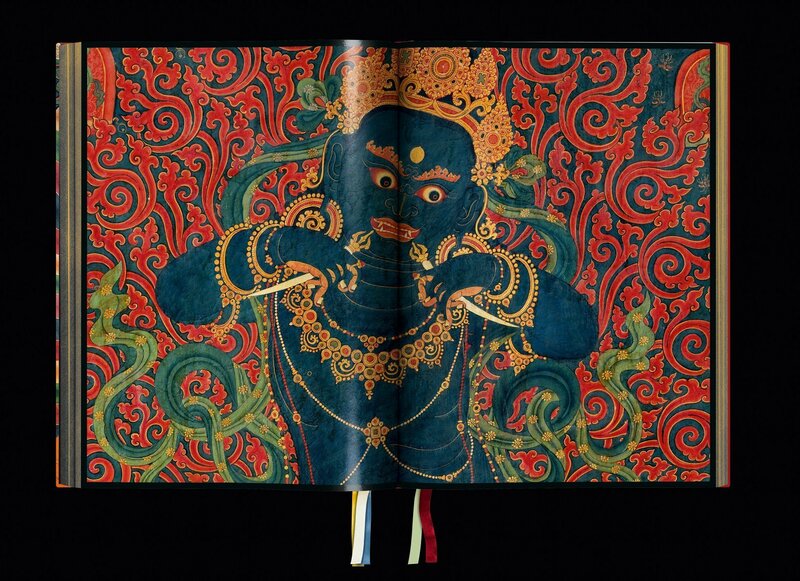 Shalu became one of Tibet’s most famous centers of learning, under the direction of the great polymath Buton Rinchen Drub (1290–1364), and today it holds one of the richest surviving treasuries of Tibetan murals. 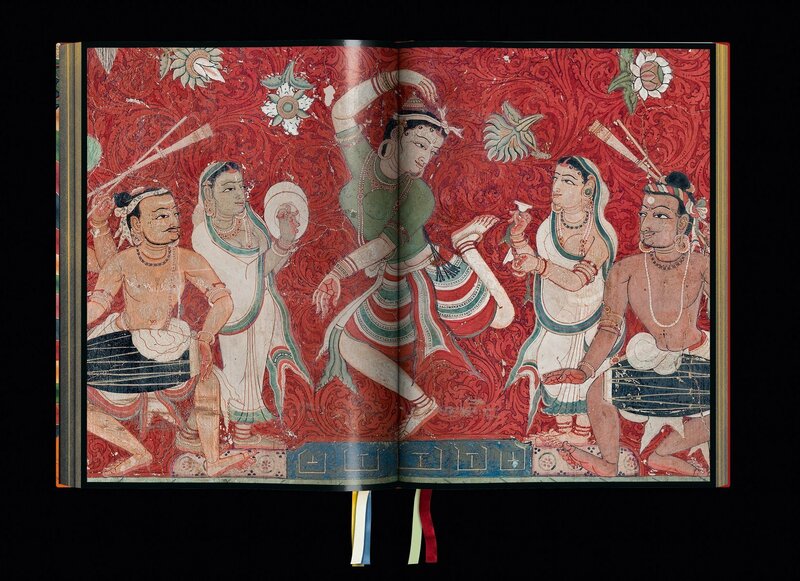 A large number of these works, especially those in the khorlam, the circumambulatory, are unique examples of the school of art founded by Arniko (1245–1306), a brilliant young Newar artist from Kathmandu who had been invited to Beijing in 1263 to meet Kublai Khan. The Lukhang Temple lies on an island in a pond behind the Potala Palace. Its murals are of key importance as they were commissioned by Tibet’s Gelug rulers to illustrate spiritual practices closely associated with the Nyingma, and because some of Tibet’s finest artists created these treasures. At the heart of the temple is a triptych of murals showing some of the most advanced yoga and meditation techniques. 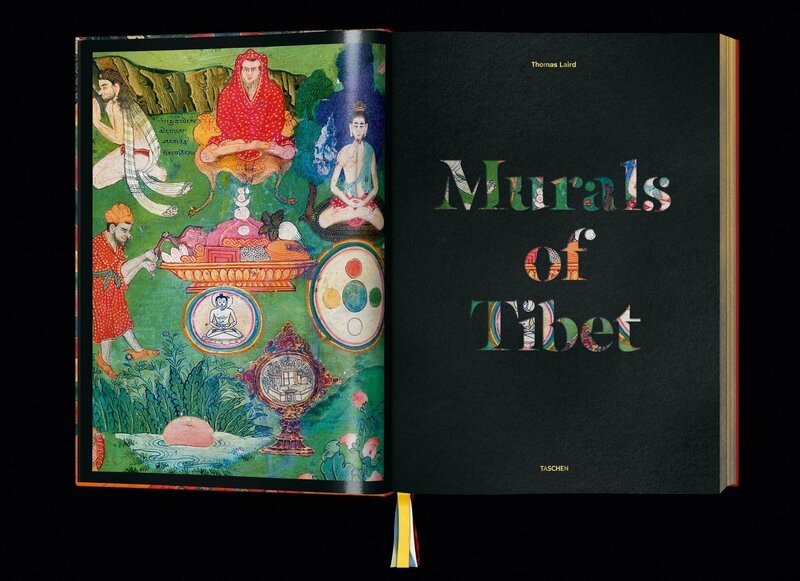 Many practices and ideas illustrated here are depicted in no other murals in Tibet. Founded by Taranatha, the most outstanding scholar of the controversial Jonang order and a major figure of early 17th-century Tibet. The surviving murals at Puntsoling reflect his unique vision. The magnificent site sits astride a white rocky crest above the vast Raga Tsangpo River, in view of one of the yogin Thangtong Gyalpo’s finest iron suspension bridges, with ruins of one of Tibet’s most ancient libraries, Denkar, perched on a towering rock above. Built as a center of learning and translation of Buddhist texts. A stone stele declaring Buddhism to be the state religion of Tibet was raised during construction of the monastery, and it can still be seen today in front of the main temple. Samye was built as a cosmogram, a mandala of the Buddhist universe. The “Central Peak Temple,” at the center of the mandala, symbolizes the world mountain, the axis mundi. The temple also hosts the Gate of Souls. Tibetans believe they must pass through here to enter the next life. Gyantse Palkor Chode monastery, with its Great Kumbum Stupa, is one of the finest surviving religious sites in Tibet. A central concept of Tibetan Mahayana Buddhism is the mandala of the Buddhas of the Five Families. They are fully illustrated in the iconography of the Kumbum, also called “Great Many-Doored Auspicious 100,000 Image Stupa That Liberates on Sight”: the entire structure is a 3-D mandala, an ideal cosmogram, a guide for the Buddhist practitioner on his or her path to enlightenment. The original Potala Palace was built ca. 633 as seat of the Tibetan Empire. It was refurbished and enlarged to its present majestic dimensions in 1645, as it had become the official seat of the Fifth Dalai Lama and his newly founded Ganden Phodrang government—which moved there from its old quarters in Drepung Monastery. The White Palace was built as the Dalai Lama’s residence and seat of government while the Red Palace was destined to house the funerary stupas of the Fifth Dalai Lama and his line. Sakya’s proximity to the Indian subcontinent—it is situated midway between Lhasa and Tibet’s closest neighbor, Nepal—kept it open to external influences, especially from Nepal. Thus, the paintings and sculptures of the Sakya—in this monastery and in the Tibetan Buddhist traditions fostered by the Sakya among the Mongol—are deeply inspired by the Baltri Newar style, which is also one of the earliest and most constant foreign traditions of Buddhist art to touch the Tibetan world. Drepung became the largest of all Tibetan monasteries. Being the seat of the Ganden Phodrang (or government) under the Second Dalai Lama, there were seven colleges with vast library resources and a renowned medical clinic. Nechung, the small temple nearby, is the seat of the State Oracle of Tibet, a specially designated monk, who acts as the human “support” for a deity that enters his body as he goes into a trance, making utterances that are noted down and interpreted by monk scribes. The Guge kingdom expanded across the northwestern Himalayan range, incorporating in its territory present-day Ladakh and Purang, as well as the high desert region of Mount Kailash, the axis mundi revered even today by millions of followers of four Asian religions: Buddhism, Hinduism, Jainism, and the ancient Tibetan indigenous Bon. Superb murals from the 15th century survive today, and their inscriptions suggest that Tibetans were trained in the temple workshops alongside master craftsmen from Kashmir.